does this make me a Masterchef? 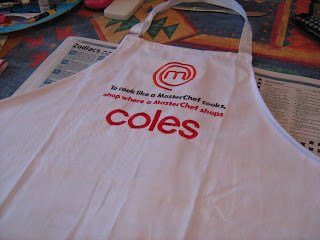 We've been asked to wear these aprons at work. I wasn't at all keen, until the Boss handed me one and said "put this on". I've had the most relaxing day. Woke at the usual 4am, remembered I wasn't going in to work and went straight back to sleep. Up again at 6.30, wandered into the lounge, turned on the heater and the i-pod, curled up on the couch in my fluffy pink dressing gown with a book, glass of juice and bowl of dry cocoa pops. Dry, for the crunch. Ate a couple of cold&flu tabs. Rested and read. Had a nap while the music played. Didn't switch on the TV at all today. As I'm typing this at 6.15pm, the music is still playing. At some point I showered and dressed. Coffee and raisin toast for lunch. More cold&flu tabs. Finished my book, chose another, read until I fell asleep. Still on the couch. No appointments, no other commitments. Lovely way to spend a wintry day. Nothing serious, stuffy nose, headache, general achiness. Lots of sleeping. I'll be fine. But, I don't feel like cooking. Dinner tonight is a bowl of dry nutrigrain, (love that crunch), and a glass of raspberry fizz to wash it down. Thank you to those few people who persist in coughing and sneezing straight at my face while passing me money at the checkout. Couldn't you at least turn away? Even a little? ...that once held clothes I hadn't worn in years. So, we now have a woman as Prime Minister. I freely admit I know nothing about politics. Skim over the headlines in the papers without reading the stories. All I know is they make promises to get elected, then spend the next few years breaking them. Or bending them. Today I was asked, "What do you think of Julia Gillard?" My immediate response was "she looks like Jodie Foster". Then I admitted that I don't take much notice of politics, so I'll be adopting a wait and see position. I've bought newpapers, but not yet read the articles. I'll try to, tomorrow. I understand Julia comes from a working class background? But she's been living in Canberra for a while, hasn't she? So does she still hold true to her roots? To see a favourite customer looking so very fragile. This man has always been thin, but he came into the shop today looking as if a breeze could blow him over. Now, normally, he comes in, smiling and happy to talk as I process his mountain of cat food and kitty litter, some frozen meals for himself. He hasn't been in for a while. Today, he shuffled in so very slowly, walking so very carefully, as if his legs might break at any step. His face is sunken and has taken on the yellowish colour of the terminally ill.
Today, he bought only a few packets of dry cat food, nothing at all for himself to eat. He confided that he'd just come out of hospital again and this episode had been bad. I'm afraid that my friend is dying. Knock, knock..."come on in J." Mr upper-body-strength strolls in, takes a look at the bits all over the floor. I show him the picture instruction sheet and he tosses it back at me. 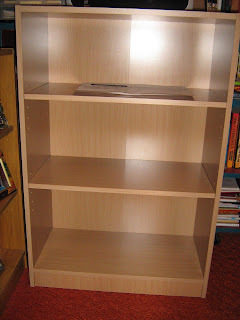 "You know I can't follow these things; just tell me where to put the screws, where to put the little dowel thingys." So I tell and he constructs. 40 minutes and it's done. "You need better quality screwdrivers, these are crap. Did you make the spag bol?" M couldn't come with me, the baby's got an ear infection." He swallows a huge bowlful. "Are you going to eat those leftovers?" "Can I take them home?" My son's best mate. Through thick and thin, these boys, (men really, both 30 something), stick together. The f... f... funandgames desk! ...from the pieces. Sighed with pure pleasure.. Checked and counted. All parts present. Looks really easy.Instructions are clear. Began construction. Came to a screaming halt very quickly. Swore. The supports for the keyboard shelf have to be screwed on. The screws won't go in more than halfway. What the f***? It's chipboard, not hardwood! So there I am. Can't screw them in, can't get the screws out either. More swearing. Tossed the screwdriver and made chocolate mousse instead. Calmed down. Then rang a friend with much more upper body strength than I have. He'll be out on Thursday. Wants spaghetti bolognese as payment. Now there's something I can do! Don't need a screwdriver either. And it's just 5 minutes walk from my home. 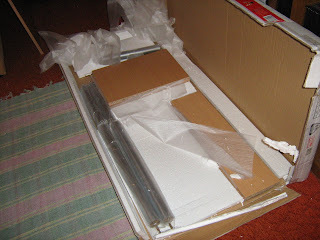 Tomorrow, I put together my new little computer desk. When environmentally friendly alternative bags were first introduced, I thought they were a great idea. They were sturdy, re-useable, had a rectangular base so it was easy to pack goods into them, and they held so much more than a plastic bag. But now, after years of using these green bags, I begin to see the problems. Maybe all you Eastern states had the right idea after all? a) They hold so much more than plastic bags, which makes them much heavier, something you don't really notice at first. ...are almost all gone now. Leaving only the fat, furry, grey buds that will become the leaves and blossoms of next spring. 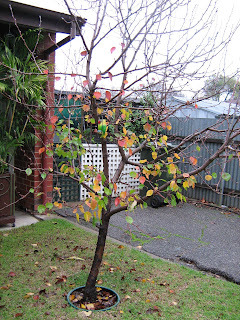 This tree was planted in my front lawn the third summer I lived here. It was just one metre tall then. Now, the topmost branches are just above the gutter height. By next summer it will be higher still, throwing very welcome shade onto the big front window of my home. It's a manchurian pear tree, the very same as the ones planted in the streets around here. Fast growing, lovely autumn colours and little berries that the birds love. The lovebirds that you see in the second picture aren't real. They're plastic, from the Reject Shop. Down the end of the yard, often in the corner, this little building was an icon in Australian history. Everyone had one. Inside it was a bench seat, with a hole cut into it, sanded smooth to prevent splinters. Some families left theirs "au natural", others painted and decorated, even to potplants on the corners of the bench seat. 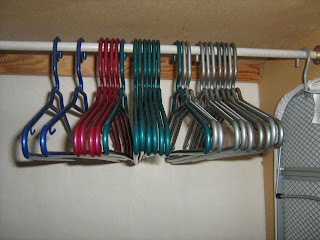 The lovely Kim over at http://frogpondsrock.com has written a very expressive piece about how she measures her success. Which got me thinking, how do I measure success? Very differently, as it turns out. It's all about the dollars and cents. sounds awful, I know, but there it is. Personal happiness for me and my family is in there too. Things were bought "on the book" through the week, with payments being made weekly, on paydays. everyone remembers Planet of the Apes? I'm watching it right now. But, ignoramus me, had no idea there were 5 movies made, and available in a boxed set. ...and bought it. 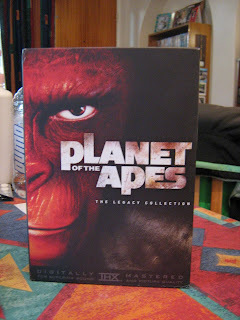 The sixth disc in the box is a documentary titled Behind the Planet of the Apes, hosted by Roddy McDowell, and has interviews with Charlton Heston and Kim Hunter. The doco takes us from production meetings to makeup sessions, then on to the movie set to see the actual filming of this science fiction masterpiece. I'm looking forward to seeing this after I've watched all the movies. Back in the summer and well into autumn, I became quite famous at work for saying how much I hated the heat and wished to be cooler. "Bring on the winter!" I'd say. Well, here it is. Winter. It's just barely begun and already I'm rugged up like an eskimo and wishing I didn't have to leave the house. Or at least until October. I suppose I'll become acclimatised soon enough, and go back to my daily afternoon walk. At least the walk to work warms me up enough to function for the short time I am there each day. 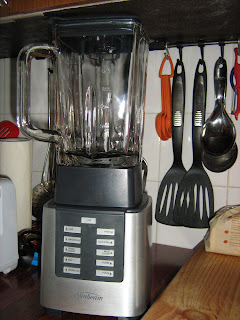 I love home made soups, so this gorgeous machine is my new favourite gadget. I've had it for only a short time, but it didn't take long for me to wonder how the heck I'd managed without it. All those years of pushing cooked foods through a sieve whenever I got to the "blend" or "puree" stage of a recipe. I'm currently reading "In Defence of Food" by Michael Pollan. "With the rise of industrial agriculture, vast monocultures of a tiny group of plants, most of them cereal grains, have replaced the diversified farms that used to feed us. A century ago, the typical Iowa farm raised more than a dozen different plant and animal species: cattle, chickens, corn, hogs, apples, hay, oats, potatoes, cherries, wheat, plums, grapes and pears. Now it raises only two: corn and soybeans. This simplification of the agricultural landscape leads directly to simplification of the diet, which is now to a remarkable extent dominated by--big surprise-- corn and soybeans. You may not think you eat a lot of corn and soybeans, but you do: 75% of the vegetable oils in your diet come from soy (representing 20% of your daily calories) and more than half of the sweeteners you consume come from corn (representing around 10% of daily calories)." 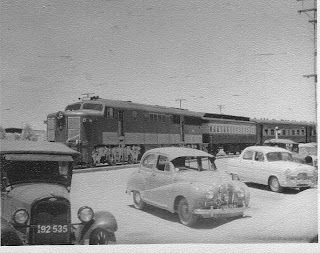 We arrived in Port Pirie late one night on the "Bluebird", (not the one in the picture, not sure what year the photo is from), a passenger train that regularly ran from Adelaide. The year was 1957. In those days the trainline ran down the centre of the main street to where the railway station was. This old railway station is now restored and used as a museum. The newer railway station was built across the paddock from the high school while I was there. We'd sit on the oval during lunch and watch the construction. Being so far from Adelaide, television reception was poor, so very few people had TVs. By 1960, more people had television, viewing made possible by antennas mounted on large towers similar to those carrying electrical wires across the country. So instead, I give you.. In the midst of wanton destruction by large corporations, a ray of hope. The following are quotes from an article in last Saturday's Advertiser. "Rugged bush, scrub and sand dunes in the state's north -an area twice the size of Adelaide -has been set aside for conservation. The former sheep and cattle station, Witchelina, is home to rare and threatened birds, mammals and reptiles. When scientists survey the site in October, they also expect to find new species. South Australia's largest conservation charity, Nature Foundation SA, bought the 4200sq km property." "Witchelina is the largest property bought to date for the National Reserve System through the Government's Caring for our Country program." This is how I shop. Most weeks anyway. Sometimes I'll have stuff delivered. Not having a car, or even being able to drive, I find these little trolleys really handy for getting groceries home. Luckily, I've always lived close enough to supermarkets to make this method possible. These little trolleys come with small wheels at the back and tiny wheels at the front. Are they really as necessary as we've been led to believe? It's my opinion that only pre-packaged raw meats, dairy products and breads need a clearly visible use by date. On everything else, I'd prefer to see a "packed on" date. That way we could instantly see how old the things we are buying actually are. 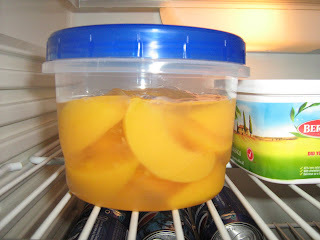 Many things are filled with preservatives, natural or otherwise, and have a long shelf life. So buying something labelled "use by June 2011, doesn't really give any indication that the item was canned (or jarred or bottled) way back in, oh, let's say 2005, or earlier. I do think that things containing lots of preservative such as sugar, (jams for instance), don't really need a "use by" or even a "best by" date at all. Everyone knows these things will last unopened for quite a while, and once they are opened, who keeps them for more than a month anyway? Especially the plastic screwtop kind. So when I saw these on special at Coles, naturally I bought a few. No, not the TV show. The early morning air. No matter how cold, wet, and blustery the weather gets, it isn't properly winter until the iciness in the dawn air cuts into your cheeks as you walk to work. The frosty air also makes my eyes and nose run, so that when I get there, I look like I've been crying all the way. In spite of this, the midday sun yesterday still had enough heat to put a light sunburn on my nose and cheeks while I walked home again. 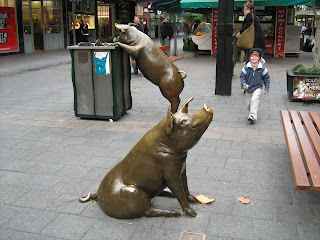 These two bronze pigs are Oliver, (in the bin) and Horatio. There are two other pigs, Augusta and Truffles, but I don't have photos of them. These silver balls are a popular meeting spot, because they're so very easy to find. Tourists are often seen being photographed by them. Kids love to rap on them to hear the sound. Inside the best chocolate shop in Adelaide. Tonight's Today Tonight program features an article on filthy supermarkets. Safeway, Woolworths and Coles have all been listed. But not ALL stores obviously. I'm happy to mention here that yesterday I was asked to pass on a compliment to the store manager on how neat and clean "my" Coles is. I woke up this morning with Elton John's 'The Way You Look Tonight" looping through my head. Could. Not. Stop. The. Loop. 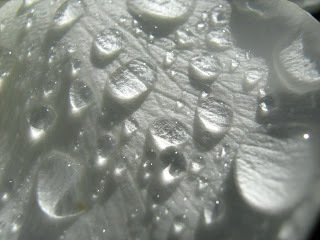 I tried deliberately running a few lines from several favourite songs, even turned on the i-pod while I ate breakfast. This seemed to work, but as soon as I started the walk to work, there was Elton John again. Pfft!